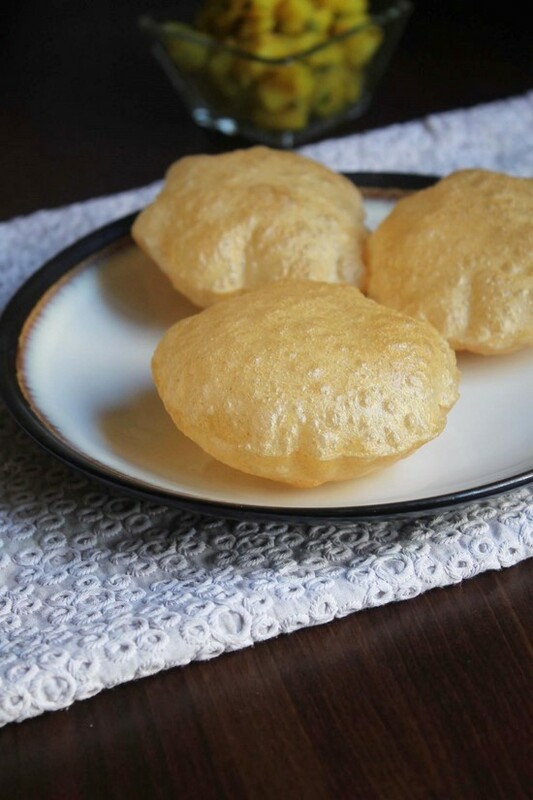 Poori Recipe / Puri Recipe – The popular Indian deep fried and puffed bread made from whole wheat flour, salt and water. This is very basic recipe I am sharing here that you all might know how to make it. But I think this will be helpful for beginners. In India pooris are always there in menu during festivals or special occasions. I have not seen any wedding functions meal without poori in Gujarat. Poori is always like a treat during my childhood days. When guests are coming for lunch, then puris are always in the menu. But now a day, I am not making poori that often like my mom. I am making it once in a six month. There are two reasons behind it, it is full of calories which I don’t need extra at all and second hubby does not like poori. He prefers roti or paratha instead. Sometimes I make masala puri instead of plain. 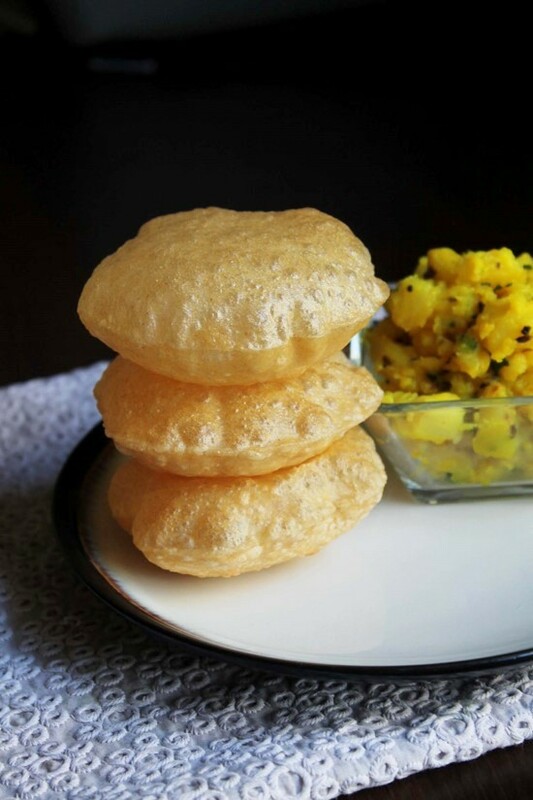 Poori recipe is very versatile that it can be paired with savories or sweet. It can be eaten in breakfast or lunch. Any kind of potato dish whether it is dry version or gravy is like match made in heaven. Poori is also goes well with sweet dishes as well. 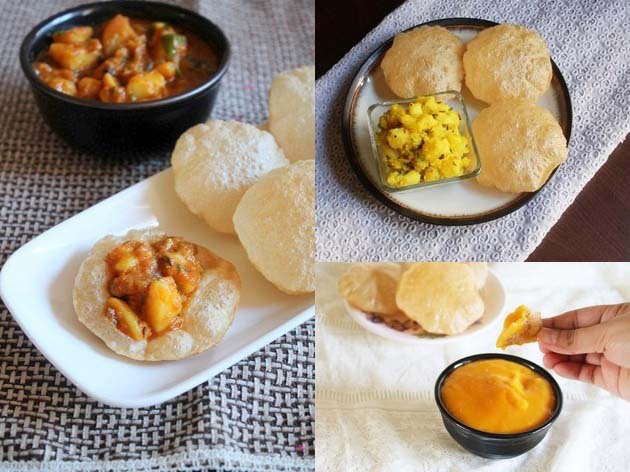 Below in the pic, Punjabi Aloo Poori, Maharashtrian Poori Bhaji and Aamras Poori. 1) Take whole wheat atta and salt in a bowl and mix well. 2) Add a teaspoon of oil and mix well with your fingertips, so everything is incorporated well. 3) Now add little water at a time and start kneading the dough. It should be smooth and tight (NOT SOFT like roti or chapati dough). 4) Cover the dough and let it rest for 15 minutes. After resting time knead the dough once again to smooth out. 5) Divide the dough into 12 equal sized portions, Make smooth ball out of it. 6) Flatten it out between your palm and make disc. Keep those discs covered with kitchen towel, so they don’t dry out. 7) Now using rolling pin and rolling board, make 2-3 inch diameter circle. It should not be too thin or too thick. Never use any dry flour while rolling as a dusting. Otherwise flour will burn while frying and then that burnt black flour particle will stick to the next poori. 8) Roll few pooris and keep them in a plate, also keep them covered with kitchen napkin. poori should be rolled at even thickness. If it is thin from one side and at some part it is thick then it will not puff up while frying. 9) Heat the oil in a pan on medium heat. Once hot slice one poori into hot oil. By very gentle pressing using back of slotted spatula fry them. It will help poori to puff up. 10) As it is puffed up and bottom side is light brown meaning no more bubbles in the oil. Then flip it. 11) Fry the other side until it is light golden brown in color. Do not fry for long time otherwise it will get crispy and hard with dark brown in color. we don’t want that. 12) Remove it from the oil using slotted spoon and place on paper towel lined plate. fry all the pooris same way and serve. Best served fresh. If you are making it for travelling or picnic then Store them in insulated container while it is warm. If you let it cool completely before storing then it will get chewy. 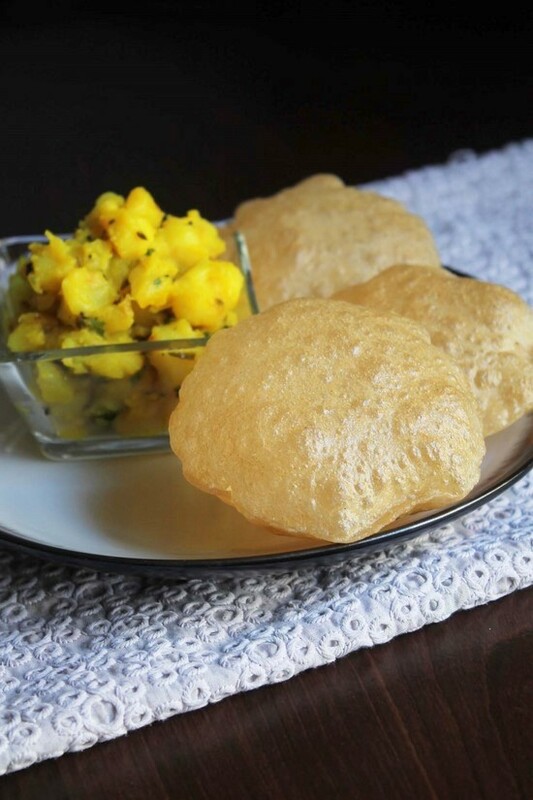 Serving suggestion: Poori can be served with vegetable side dishes or curries. What do you like as a side dish with poori? Please let me know in comments below. My favorite is Shrikhand-Puri. I have mentioned all the possible tips in the method itself so read it carefully before making it. 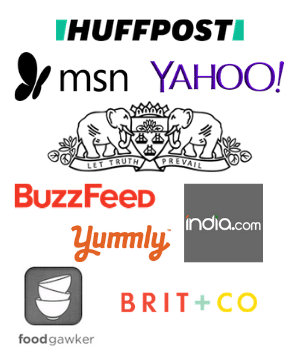 Here I am summarizing those points to keep in mind while making poori. Dough should not be soft like roti or loose or sticky. It should be slight stiff yet smooth. So always start with little water at a time and keep kneading the dough. What happens if it is loose or soft? You will need dry flour as a dusting while rolling pooris. And as I mentioned earlier, those dry flour will get burn during frying process and those burnt particles will stick to the next batch of poori. So NEVER use dry flour while rolling. If needed apply some oil to the rolling pin and board. Roll the pooris of medium thickness. If it is too thin like roti then it will not puff up while frying. Keep rolled pooris and flatten discs covered with kitchen towel. It prevents them from drying out. after frying couple of batches of poori, if oil temperature becomes too hot then reduce the flame or turn off the flame for few minutes. Or if it becomes cold then increase the flame to high for few minutes. So point it maintain the oil temperature (medium hot) by increasing or decreasing the heat. If oil is too hot then poori will get brown, crispy quickly or may get burn. If oil is cold then it absorbs more oil and will not puff up. This point is not only for poori. It applies to any fried food like pakora, kachori, samosa. The poori recipe I made here has light brown color. If you want golden brown color then add pinch of sugar in the dough along with salt. As it fries, sugar will caramelize and helps poori to get golden color. Take whole wheat atta and salt in a bowl and mix well. Add a teaspoon of oil and mix well with your fingertips, so everything is incorporated well. Now add little water at a time and start kneading the dough. It should be smooth and tight (NOT SOFT like roti or chapati dough). Divide the dough into 12 equal sized portions, Make smooth ball out of it. Flatten it out between your palm and make disc. Keep those discs covered with kitchen towel. Now roll intp 2-3 inch diameter circle. It should not be too thin or too thick. By very gentle pressure using back of slotted spatula fry them. It will help poori to puff up. Thank you.. 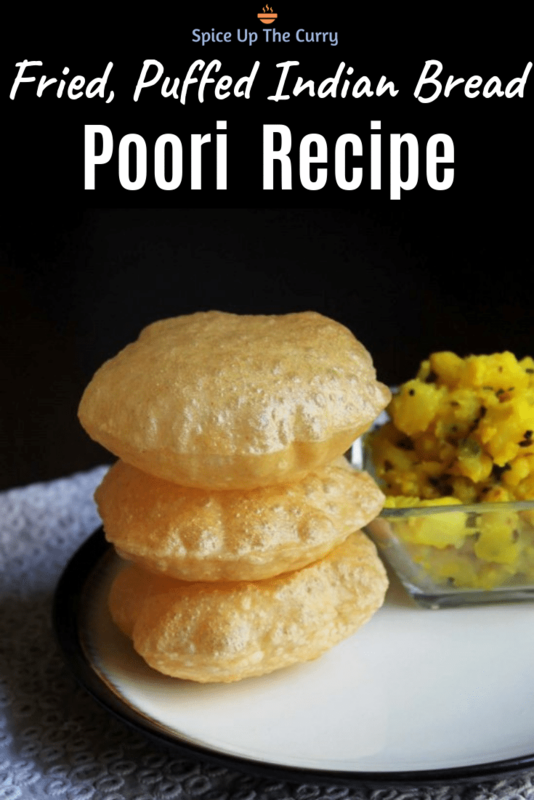 I was craving for pooris today morning for breakfast and I followed this recipe to the T and I got really crispy puffy pooris and it’s so easy to make. It really helps that you wrote it in US cup measurements ,it’s simpler to follow.